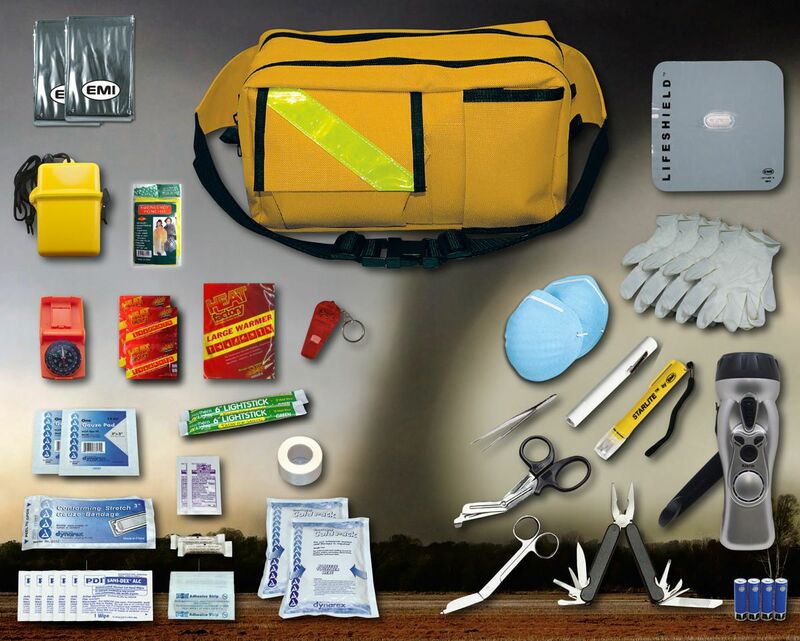 Includes: [Survival Equipment] The Survivor™ 4 in 1 Flashlight, 12 in One Tool, EMS Shears, 2 - Hand Warmers (10 HRS each), 1 - Large Hand Warmer (24 hrs. ), Survival Whistle with Led Light, Clip-on Folding Compass, Starlight - Waterproof Flashlight, 2 - 6" Green 12 Hr. Light Sticks, Penlight, 4 AA Batteries. Protection Items– 2 - Rain Ponchos, 2 - Thermal Rescue Blankets, 2 - Cold Weather Molded Masks, 1 - Waterproof Storage Containers. First Aid Products– 2 - 3" x 3" Sterile Pads, 10 -1" x 3" Adhesive Bandages, 1 - 3" Sterile Conforming Bandages, 1 - 1/2" Adhesive Tape, 6 - Antimicrobial Hand Wipes, 2 - Triple Antibiotic Ointment, 2 - Sting Swabs, 2 - Ammonia Inhalants, 4 - Latex Gloves, 1 - 4 1/2" Bandage Scissors, 1 - 4 1/2" Splinter Forceps, 1 - CPR Lifeshield, 2 - Ice Packs 4" x 5". A valuable asset to the kit is The Survivor™ hand-crank flashlight which also features a radio, alarm, LED flashlight, and cell phone charger. EMI’s Rescue Fanny Pack conveniently carries all of the supplies. The fanny pack has three outside pockets and two large zippered inside pockets and two large zippered inside pockets. The adjustable nylon webbing can fit 20" to 54" waists and has a quick release buckle. It has yellow reflective tape and measures 10"L x 6"H x 5"W. It weighs approximately 3 lbs.